If you’ve been living (and drinking perhaps) under a rock the past five years, let me catch you up. It’s big in cocktails. It’s big outside of the cocktail world, and its especially big within and in gin. Need I remind you of Knockeen Hills Elderflower Gin ([icon name=”star” class=””][icon name=”star” class=””][icon name=”star” class=””]), Warner Edwards Elderflower Infused Gin ([icon name=”star” class=””][icon name=”star” class=””][icon name=”star” class=””][icon name=”star” class=””][icon name=”star-half” class=””]), or Gordon’s Elderflower Gin ([icon name=”star” class=””][icon name=”star” class=””][icon name=”star” class=””])? If that’s not enough for you (or you want to have Elderflower cocktails without buying a custom made Elderflower Gin), Fever Tree Tonic Water has released a bubbly with the Elderflower already in it. Fever Tree Elderflower Tonic is perfectly floral on the nose, sweet, almost chewy, candy like elderflower. Very sweet actually. Nice and inviting, and perhaps exactly what you’re looking for. The fizz is tight and rather concise, the bubbles are small and contained. There seems to be good deal of them popping on the palate. A slight orange peel lift compliments the elderflower on the palate. The finish has a clean quinine enhanced bitterness. It seems like it may be cloying until the bitterness kicks in. Lovely and effervescent, I quite enjoy it even on its own as an Elderflower tonic soda. I tried a little bit with Bluewater’s 100 Proof Organic Vodka. Still floral on the nose, with a creamy, graininess as well. The palate is brightened with the elderflower notes. The clean bite of the quinine is welcome and the overall profile of the base spirit lingers with you well after the flavors subside. Quite nice, and although I’m not a vodka drinker I’d have to admit, the two compliment each other quite nicely here. Recommended. 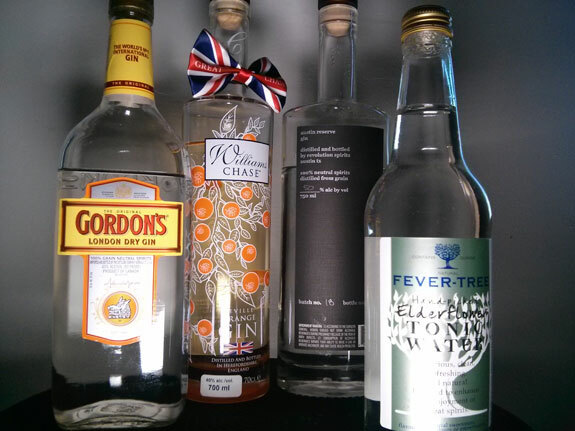 First, we tried Fever Tree Elderflower Tonic with a classic gin. And you can’t get much more classic than Gordon’s ([icon name=”star” class=””][icon name=”star” class=””]). Bright juniper at the fore, Elderflower carries the back side, but it melds very nicely with the back notes of Gordon’s as well. The bitterness is in lockstep with the finish of Gordon’s. Well balanced and uplifting, this is one delicious cocktail. I’d recommend this to anyone, even if you’d normally not enjoy a strong juniper forward gin. This tastes delightfully floral without ever being too much. Recommended. Next, for a twist on things, we paired it with Chase’s Orange Flavored Gin– a citrus forward contemporary gin. Seville Orange peel dominates the nose, with hints of Elderflower in the wings. But it’s the bitter orange flavor which comes on early, somewhat overpowering the tonic’s flavors. The gin starts bright and ends up bitter in the middle, and just as the tonic’s bitterness comes on, the whole drink just tastes… bitter. This might have its fans, but I might not make this my first choice. Finally, we looked for an herbal contemporary styled gin to pair up. Austin Reserve Gin ([icon name=”star” class=””][icon name=”star” class=””][icon name=”star” class=””][icon name=”star” class=””]), a recent review, with a decidedly rosemary-frontal profile was an ideal partner. Savory and spice-cupboard-like on the nose; intimations of sage, rosemary and thyme dance on the nose. The tonic seems quietly settled just behind it. The palate though is noticeably lifted by a bright song of rosemary, orange and elderflower. It’s not too loud though, and the bitterness quietly parallels a long rosemary led finish. Really quite nice, and Fever Tree Elderflower Tonic blends with gin quite well. I liked it best with the really classic gins; however, it has potential with other gins as well. The Elderflower is present, but not as domineering as it could be. Well restrained, but loud enough to be heard. This tonic has mass appeal, and nearly anyone who likes the flavor of Elderflower will likely be a fan of this tonic. We certainly are, chalk it up to another win for Fever Tree. Fever Tree’s Elderflower variation is available from Amazon. I had the pleasure tonight of trying this tonic with 3 different gins, first with G.W. Goodwynn & Co. – a French gin that I had never had before. On it’s own, it is the most vodka-like gin I have ever tasted. Very muted flavors, the ethanol is very much the dominant flavor. To it’s credit, a very clean taste. It made an excellent and refreshing G+T. Next up was Moody June, one of my favorite gins, local to my area (Austin, Texas). Again, excellent, although the strong juniper-and-licorice flavor of Moody June send the elderflower to the background. (I eagerly await your review of Moody June. I think it has a surprise or two for you!) Finally, I tried this tonic with Hadley & Sons, an American gin from South Carolina. This was the mildest of the bunch – Handley & Sons is the closest to a traditional London Dry that I tried this tonic with and it was pleasant with a nice Elderflower taste (juniper taking a bit of a backseat to the tonic) but nothing that I would recommend with any particular enthusiasm. I will stick this tonic for the time being; I’m very curious to see how it will mix with Tanqueray which, after some time away from traditional gins, welcomed me home like a long-lost love when I decided to skip the Bombay Sapphire at the restaurant’s limited selection a a week ago.. I prefer this tonic to Q and it’s a happy medium between my preference of Fever Tree Indian and Canada Dry. Hello I live in Montreal Quebec, where can I buy this Tonic, is it available in Ottawa, Montreal, Toronto, Quebec City ? Love this tonic….I mix it with Kettle one vodka. This vodka has a cucumber, mint infusion. Mixes great with elderberry tonic..